A very pretty, petite, original antique cast iron fire trim, suitable for surrounding a small wood burner or fire basket. 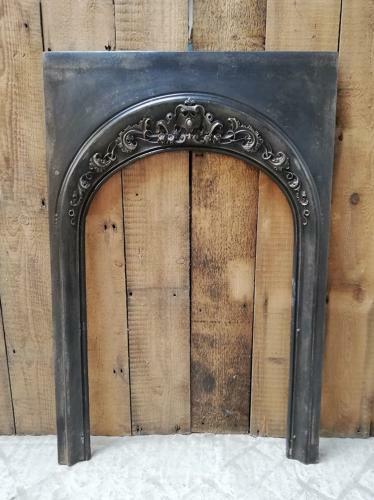 The cast iron insert has a pretty arch with lovely decorative motif, including acanthus leaves and flowers. The fire trim has a dating kite mark on the back. The mark is eroded but the fire dates to pre 1884 when the new dating system was introduced. The iron has been burnished and lacquered and has an attractive silvery finish. The trim is in good, useable condition, however due to age there are some slight signs of use and wear. The front face has some character tarnish and surface rust, please see pictures for details. Marks and scratches are visible due to age. The back has surface rust as expected. A very pretty iron trim with a fantastic finish that would suit a modern or period property.